The Alert Analysis report shows the various channels over which alerts have been sent and which recipients received the alerts. The report can be filtered by Group. Alert Assignment shows the distribution of alerts per person. The report can be filtered by Group and Priority. The Alert Trend Report can be run for weekly, monthly, quarterly and yearly periods. The report can be filtered by any combination of Topic, Priority and Group. MTTA tracks time to acknowledgement. The report can be filtered by Group. MTTR tracks time to resolution. The report can be filtered by Group. The Open Alerts Report allows you to view current alerts that are open. You can drill down on each of the links to view the set of open alerts for each category. You can drill down further to access the alert detail. The report can filtered by Group. 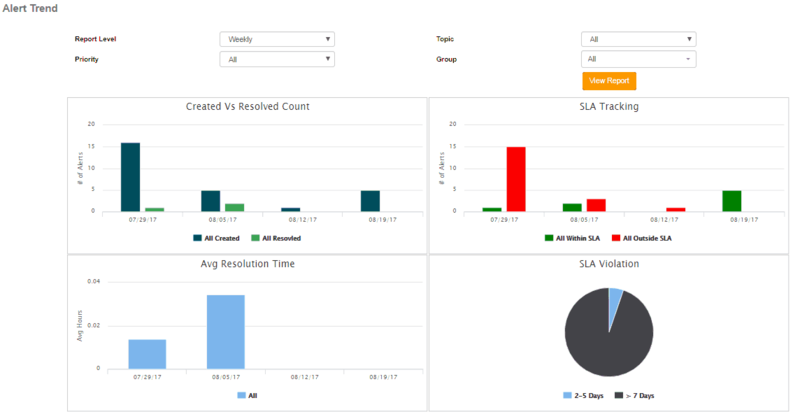 Drill down by SLA Violation, Top 5 Assignees, Priority, Status, or Topics.